The legal scan is available to review a user’s comments and identify insensitive words that contain any racial, gender or age bias, based on EEOC guidelines. Those words will be highlighted to alert the Rater to consider rewording their statement prior to submitting the review. The legal scan is both mobile and PC compatible and works with multi-language functionality. 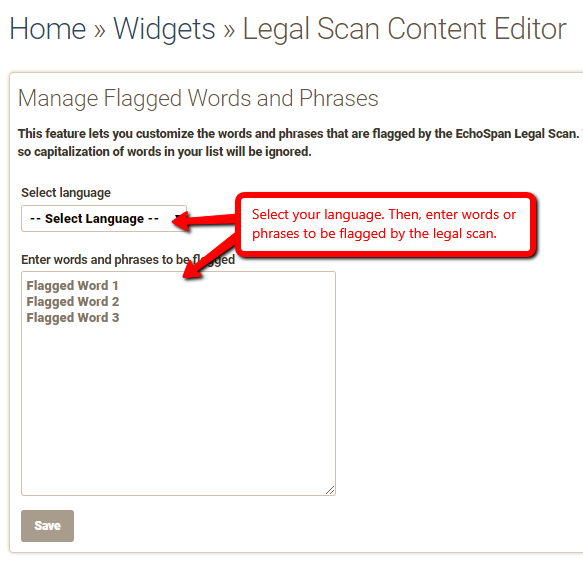 Select the “Legal Scan Content Editor” option. Enter words or phrases to be flagged, one per line, into the text box. *NOTE: By default, the legal scan is ON in all projects.